Adriana Lima is from Brazil and she has been a Victoria’s Secret Angel since 2000. I thought models only lasted for three years or something. What’s her problem, stealing jobs from younger models! Get out of the way…relatively-speaking granny! 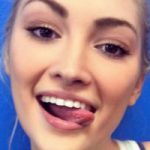 These tongue pictures are great but you need to give other models a chance!